SAN DIEGO — Jada, a familiar longtime San Diego-based classic wooden sailing yacht, has undergone a thorough restoration and is now sailing on San Diego Bay once again. The classic sailboat is available for charter, for both private and public dates. Jada is a 65-foot yawl-rig sailboat. It was a local icon, and it was docked in front of the Marriott Hotel at the San Diego Convention Center for many years. After its previous owner died, Jada dropped out of view for several years. However, the classic yacht was purchased by Carole Noska and Brad Maybury in May 2008, and the first order of business for the partners was a complete and thorough renovation. The classic lines of Jada’s Phillip Rhodes yacht design have become even more apparent as the renovation and refastening process has been completed, and new paint and varnish has been applied, according to the owners. Designed originally for bluewater ocean racing, Jada was built more than 70 years ago as a solid and swift vessel. Even today, with the advent of modern fiberglass sailing vessels, Jada is still a nimble and fast sailboat — and the vessel has all the charm and beauty of a bygone era. Belowdecks, “there is liberal use of teak wood, providing a warm refuge from the weather while capturing the romance and essence of seafaring dreams,” the owners said. Coast Guard-certified for charters, Jada now does what she was designed for: sailing on San Diego Bay and offshore, offering public and private charters. Many different charter options are now available, including lower-priced “day ticket” cruising opportunities to experience the exhilaration and adventure of open-water yachting aboard Jada. 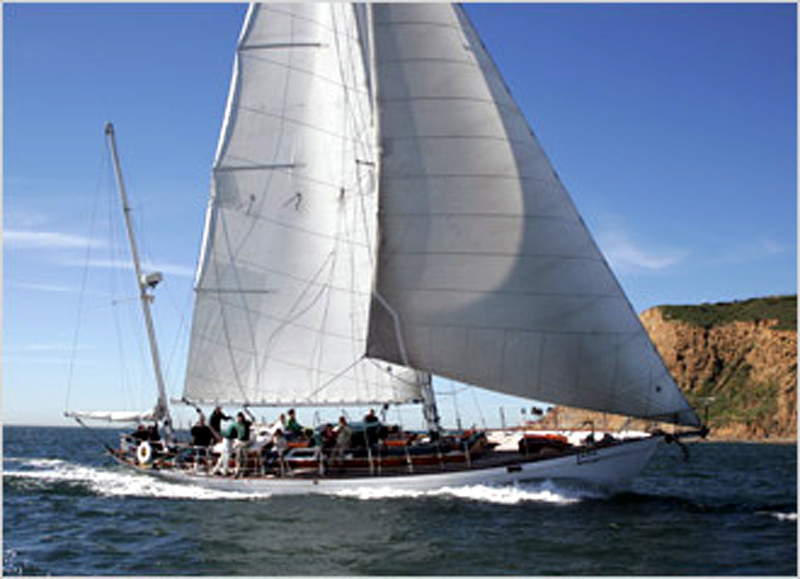 For more information, visit sailjada.com or call (619) 572-3443.